Are you someone who is rooted in tradition when it comes to decorating your personal space? And someone who always wanted to add classic and timeless design to your bedroom? Then this blog is for you, which includes tradition bedroom furniture units to give your bedroom a regal and elegant touch. 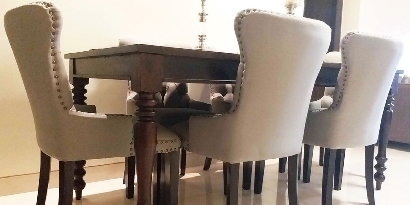 A traditional décor theme is the perfect celebration of antiques, classic arts, solid wood, richness, and warmth. You don’t need to spend a fortune to give your bedroom a look which can never go out of style. Below the blog we have a perfect rundown of 5 traditional bedroom furniture units which will be required to make your bedroom a classic place. A grand statement-making bed will set the tone for traditional formality in your bedroom. 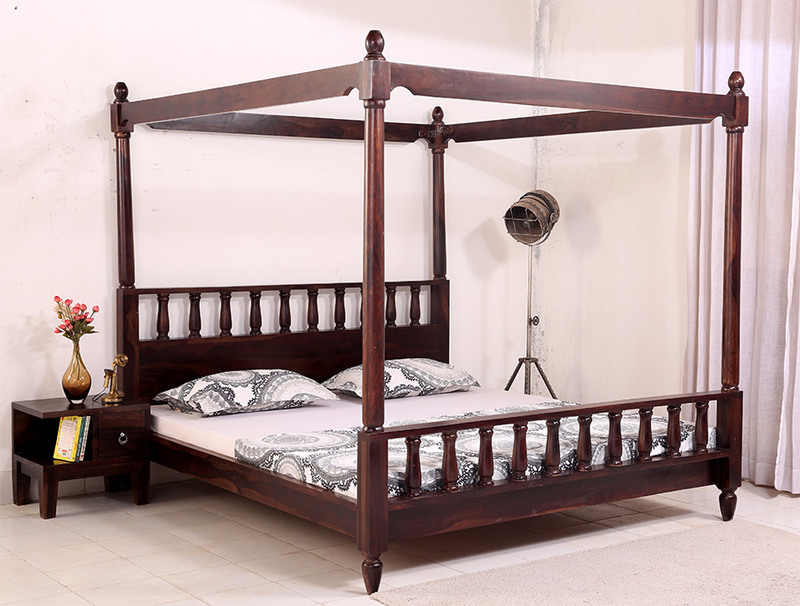 Nothing can beat the richness and warmth of this Allure Poster Bed as firstly it’s a poster bed which is an epitome of royalty and secondly crafted from solid wood. The design of this poster bed is crowned with canopy features with traditional round railing pattern at the headboard and footboard. Overall the design of this is a perfect start to give a touch of royalty and tradition to your bedroom. 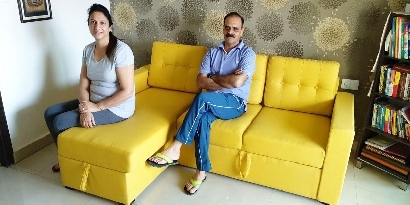 A bench is the trendy furniture piece to keep at the end of the bed. It serves both the purposes of adding style and functionality. This bench with backrest will add the perfect tradition detail in your bedroom. The main highlight of the Cambrey bench has a leaf mesh design pattern in the middle of its backrest. 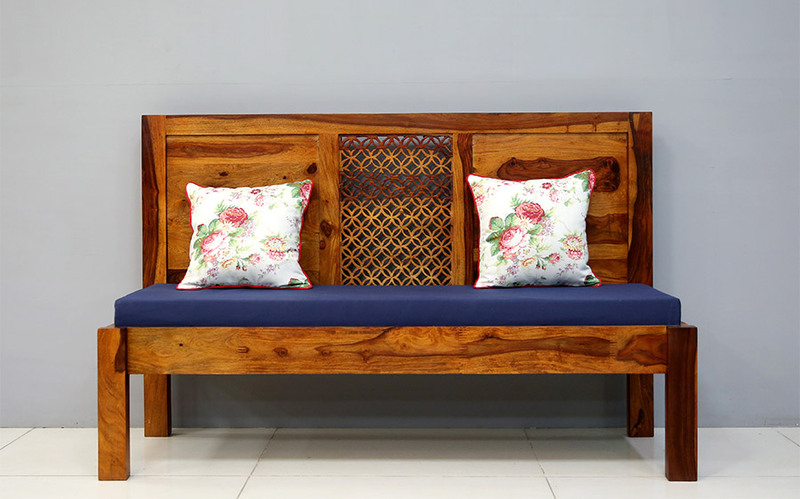 Now the best thing which comes with this bench is the upholstery seating option. With Wooden Street, you will get the option to choose the fabric according to your décor and something which can add to your visual accent. This is the universal truth that you cannot have enough storage when it comes to your bedroom. A chest of drawers will always come to rescue when you ran out of the wardrobe space. 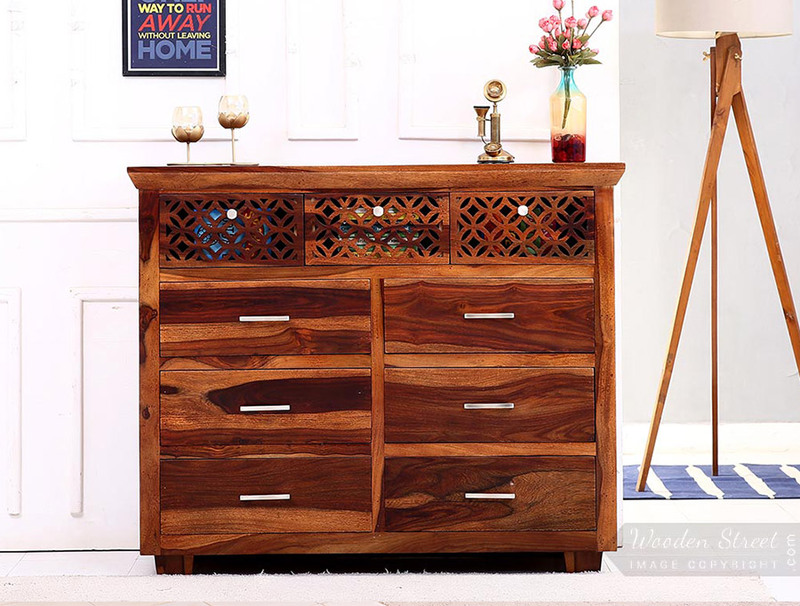 The size and the shape of this Cambrey chest of drawers are perfect as it is not a space dominating unit and yet spacious to store your stuff at utmost elegance. Plus, you can enhance the beauty of this chest of drawers by using the table top by showcasing or displaying your latest purchase of antiques. And you can also hang a classic mirror (which you will get at Wooden Street) above the chest of drawer to make it look more beautiful. This wardrobe is the perfect pick for your traditionally styled bedroom. 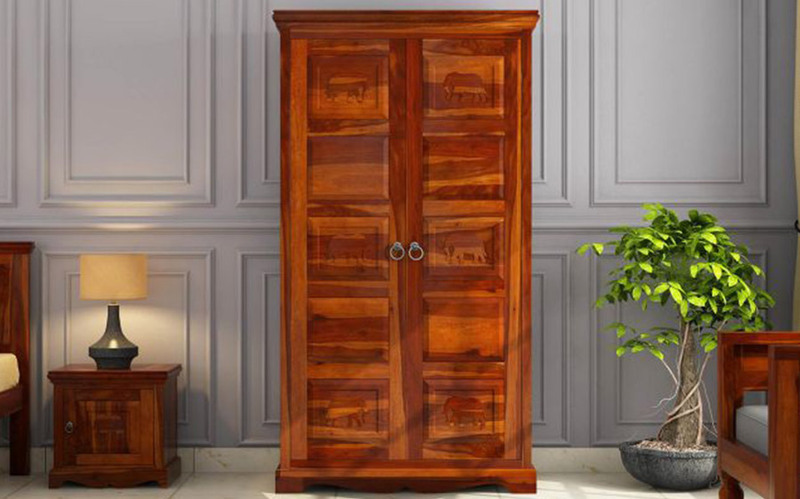 The most arresting thing about this wardrobe is the design on the doors of this wardrobe which have elephant carving. And on the top of it there are the handles of this wardrobe which are participating more in giving this wardrobe a truly traditional look. This traditional piece of furniture has everything to offer you from open shelves to drawers to hanging rod. A dressing table is a great way to make greeting ready process less chaotic and hassle-free. 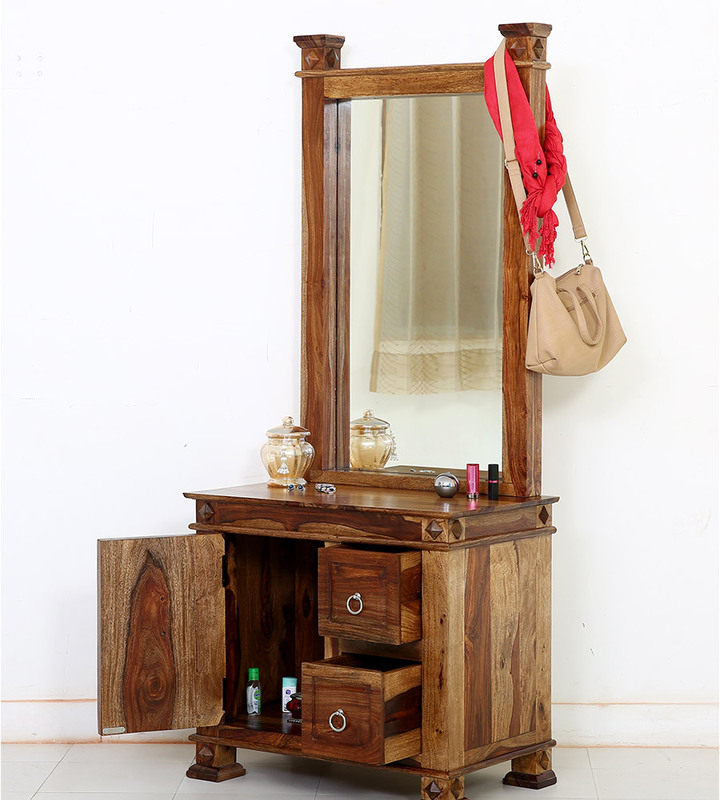 Kingsley dressing table will add an extra layer of traditional décor in your bedroom. If you want a dressing table which can serve you more than just a place to sig and brush your hair, then this dressing table is perfect for you. The design of a mirror is slender and tall and beneath the countertop, there is one cabinet and two drawers with the knobs. So, these were some of the traditional bedroom furniture units through which you can create a style in your bedroom which will never go out of style. 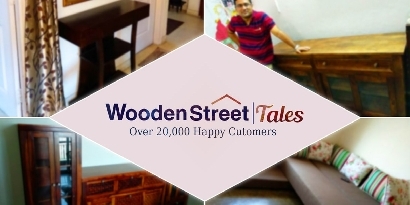 You can even customize the product according to your requirements and preference with Wooden Street.